Goo.gl url shortener is now open to everyone! I love this: the goo.gl url shortener is now open to everyone! I know the folks that worked on this, so let me answer a few quick questions. A: Google needed a url shortener for its own products where we knew the shortener wouldn’t go away. We also wanted a shortener that we knew would do things the right way (e.g. 301/permanent redirects), and that would be fast, stable, and secure. Q: Why open it up to the public? Q: Fair enough. Any cool new features? Q: Is goo.gl an “X killer”? A: No, goo.gl isn’t an effort to kill anything. I think the whole “product X will kill product Y” meme is getting a little threadbare. We needed a url shortener for Google itself. And then lots of people asked for this, so we’re opening our own url shortener to the world. Different url shorteners have different philosophies; I view the goo.gl philosophy as running a tight, fast service without piling on a ton of features. My favorite Chrome extension to shorten urls is right here, but see the official blog post for other good extensions that use goo.gl. Danny Sullivan is also writing a screenshot-by-screenshot article over on Search Engine Land. I hope you like the service. I’m biased, because I know the people that work on it, but why not give it a try yourself? I love the analytics portion of the shortener. Any chance of an API for this? Bonus points if it’s similar to the TinyURL/bit.ly APIs, so existing Twitter clients can hook right into it without developer updates. I cannot wait for the API to get released! I love the extension you mentioned, but it’s going to be a million times better once it’s tied into my Google account and I can use the analytics. Is there a privacy risk with this? a) Google Maps creates shortened links now. Any plans to release an API for this? I’d love to use this shortener for plain text emails, and be able to log in and see stats for clicks. yes the QR code just points to the goo.gl short url so it will pass thru the same way all the other clicks do. Looks like the the QR codes routes through the shortener, so I would think, yes. I *love* that feature, btw. And think of QR codes as a link from the physical to the virtual world. It can cause a QR reader (lots of iPhone, etc. apps for that) to make a phone call, send a text, go to an URL, etc. Some manufactures I know are starting to put QR codes on their packaging that point to a page with a video demo’ing the product, for instance. Lotsa cool possibilities. Matt, do you know if there are plans for URL customization? Thanks, compliments to the team. thanks matt, google always come up trumps for doing things better and with the added analytics tracking as part of the same login helps keep everything in one place. I was going to say – there are already a ton of url shorteners out there. But, this analytics feature is very handy and differentiates it from the other sites out there. I love it. Keep up the good work google devs! Matt, I’m loving the analytics integration and confidence that a recognizable google property in the link will add to the shortened url. As our time clock software links get ever longer and deeper, these kinds of features are really a benefit to our company. I am sure many users who are using other url services must have started migrating already! Will there now be an ‘official’ Chrome extension, or does Google support the unofficial one you link to? I don’t actually click on shortened URLs unless they’ve been posted by a trusted or ‘reputable’ source in the first place. As who knows where they’ll actually redirect my browser to? Does goo.gl check for malware on the destination page to help protect me? Nice addition to my Google account , I like everything in one manageable place, the stats look good addition. great news !! going to check it out now it self !!! Great, glad I read this post before going to bed. Works seamlessly and love how easy it is to get the analytic’s for the clicks. Glad to see it’s just a few SEOs on twitter going crazy about this, and not the general public! Personally, I don’t like this. Lock it back up. I liked when it was private. I took solace in the fact that whenever I stumbled upon a Goo.gl URL I could be 100% certain it wasn’t going to lead me to a Rick Astley video. The analytics portion is a really nice feature. This is great, and everybody loves the analytics feature. Great! But, is it really designed to generate different shortened URL everytime I generate the same URL? Great! But I was also expecting a few lines on Google’s bid to take over bit.ly. If rumors are to be believed, bit.ly was in talks with Google and Twitter and was seeking about $100 million. Is that true? The one thing I am looking for, and what encourages me to use anything other than competitor bit.ly is the ability to change the destination at a later date. This could be for anything as simple as changing a tracking parameter, to totally changing the destination because a resource no longer exists. Without such feature, goo.gl or bit.ly will only be a wrapper for me, I will always have to have some other shortener/tracking script in the background to provide control. Finally, the official service and its features already launched for public. However, Shareaholic already doing a great implementation of goo.gl in its Chrome Ext and Firefox Addon. 1. Why the most popular goo.gl extension itself isn’t official? 3. When exactly the API is going public? Along those questions, goo.gl still doing a great URL shortening service. I think it can’t beat Bit.ly service. But it will be one of the successful product from Google. I wonder if this is going to be an addition to analytics, so I can track clicks and referrals in my analytics account? As most of these URL shorteners are used to help with limited space ie 140 character tweets, what does this url shortner do to stop bad bots coming through? We noticed that biy.ly’s clicks are way off what Google Analytics records, will goo.gl and analytics match up? It would be great to have a URL shortener that could detect language and locale browser settings and redirect to one of many predefined URL’s based on these settings. thanks matt, for give this information. if i did not visit your blog then i couldn’t know about it. before it i was using tinyurl or something like that. I just wrote a very simple PHP-class for this service. With this class it is possible to translate simple URLs, but it’s also possible to convert text/html-documents with some links. Hii Matt, I think URL shortnerer has to come earlier, little bit late in launching. But by enabling URL shortnerer with Analytics make it more wonderful to use. Product Killer this or service killer that has become so tiresome. Great service though. One of my co-Workers has been using it off and on today and seems good. Funny where you’ll come up with post ideas eh! Crazy timing. I saw this somewhere else this morning, or last night and earlier today went and “registered” a few shorties to my sites. Very easy interface and the statistics are well, Google like. Another good work from Google! However, Matt please consider reviewing the new Google search interface. The suggestions are okay! But when you start delivering the results on the fly – at times it looks confusing. Obviously this is my very personal opinion. And might be too conservative! Sorry, if it sounds over critical. Thats a good news, when I saw you using google shortener service I wanted give a try, but was only for google use. Hello, i have a pure technical question related to the url shortener. I like this tool, and it’s fun to use it due to the statistics, great! The created links are static + dofollow links: what happens, if internal website linking is replaced by url shortener links (PR6)? The Analytics is fantastic for the type of business I am in… Thanks! Amazing tool. I like that it have detailed statistic! goo.gl has 301 redirect now my question is using link: command I have seen 302 cases as well as 301 redirect as a back link for my websiite, is there any difference in terms of passing page rank in back ground even if link command shows both forms in the result? Tinh – they probably did that due to the analytics. If I shorten a URL I want to see how many people clicked on it from my tweet / blog post / email, whatever. If I get the same URL as somebody else, I can’t attribute any of the clicks to me. This is a nice alternative to bit.ly especially with the recent news of Libya Shutting Down .ly Domains Without Notice‎. goo.gl. – I noticed this, I thought it was something you probably wrote Matt. I never saw this before I was like, ware did it come from? It is cool! goo.gl. Thank you for explaining. I have been using goo.gl for a while now and I have to say, you guys have another winner on your hand and it is quite good and fast. The best thing of course is I can be sure that Google and search engine bots will be able to follow the shortened links, thanks to proper use of 301 redirect, which wasn’t the case with each and every URL shortner out there. Chris, this is exactly our concern about link shortening services. That’s why we created our own simple service which never does a direct redirect to the linked website. Plus you can shorten as much addresses as you want into a single one. It’s called linkio.us (click my name). Perhaps you or someone else thinks it’s useful. I’m always afraid of use URL shorteners due to the fact the service can go down in the near future and I would lose all my links. Is there a way to links my urls to google analytics to have a better insight of the data in comparison to my website data? I only started using the Google URL shortener last week and it’s definately my favourite now, I’ll be looking forward to what the Google crew can think of next! That works for me – the fear is that the shortener servers will go down and you loose your links, but being that it is Google, I feel much safer in using the service. You know what a total ‘game changer’ this could be? If the mothership were to count or give credit to the links ‘on the other side’ of the goo.gl redirect, it’d eat up a boatload of that marketspace (redirect services). If links are “public” does that mean anyone can see who created the shortened URL? Thank you for the heads up with google url shortener! I’ve just added the url shortener to my crome browser (which by the way just happens to be the best browser I’ve ever used), and it works fantastic, so thank you for the kind advice. I decided to go for the lite version based on some of the feed back I read on the extension download page. I’m about as non techie as you’ll ever come across, so anything that is easy, is best for me. The fact that the url shortener is on the browser is a great idea (is anyone else doing the same kind of thing?). The ability to shorten on the fly is a real time saver. For now I like it very much. Let’s just hope that it keeps doing what it says on the tin! I’m sure the clever people at google will keep on top of this extension so I don’t see any problems. Love your blog by the way. I came here from a link in an email from Howie. And I’m glad I did. Does anyone know if the goo.gl shortener service is filtering out clicks from automated sources? Just wondering. I like the analytics feature but I’d also like to login to my google analytics account and find url stats there and shortened url stats–as well go to http://goo.gl and login with my Google account. Great to have Google offer this service. I’d also love to see an official API. Are short urls assigned by unique URL, session or some other means? If Person 1 enters domain.com and gets short url A and if Person 2 also enters domain.com, would they get short url A also? I was wondering because this would affect click data. Another innovation from Google. The service works fast sorry very fast 🙂 Actually there is more missing part according to me. But we know that it’s new, will be developed. Nevertheless it should be added the feature of “copy” like in “bit.ly” . If it is more compact and more featured , the people always will use this service instead of other system/site/service. Woohoo! I love URL shortners. I am currently addicted to stumbled upon’s, but now that google has one and with more details – woohoo! Thanks! Theres plenty of url shorteners out there but with the analytics feature this is hopefully should outperform the others. It would be nice if Google could detect if short links are going to spam site and ban the link being used on your platform? Fantastic – an URL shortener with analytics and history. I used bit.ly in the past, but will try the Google shortener now. For every company it’s very important to know how marketing campaigns perform. It would be perfect to see these analytics also in the Google Analytics Numbers, as not only traffic is a KPI but also bounce rates and conversion rates. Excellent reporting and speed, I am very impressed with goo.gl now if only they could have ajax site previews. This is a very good tool, especially since it gives a QR code too. I kept seeing them in billboards but it took me a while to figure out what they were. They are definitely getting more common. 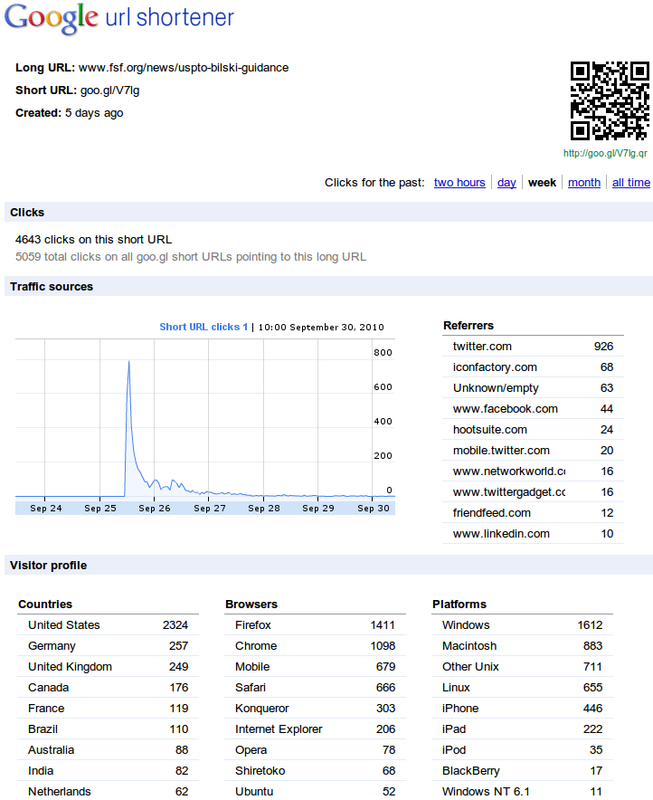 The tracking on the goo.gl shortener is a neat feature and it does track the QR code referrals. Not sure if it was mentioned in the comments above already. I saw this on twitter already. Sometimes this URL shorten service is short and sweet, but they provide meaningless, now easy to remember, confusing (ie. capitals 1, I, and l, 0 and 0), and the most important result, don’t know where it will point to. You can’t tell you’re clicking the spammy links or the real ones. Great tool, I really like using it, the stats are a great feature, as is the QR code. What I would like to know is how the shortened links will be handled with regard to SEO and inbound links to a domain? Is it not a good idea to use the shortened URL when building links to a domain? I would love the stats and features of the goo.gl link, but am not sure if for SEO purposes its going to be useless. Really great service, but I miss a very importnat feature: the remove option of the shortened URL’s. I often spread review product links with masked short urls, and want to remove them if the next product arrives. Please implement the removal of goo.gl urls. Hope it is technically possible. Great move by Google. This is a smart way of collecting unique URL’s. This tool has mainly two purposes to accomplish. One is that it shortens the URL’s for the user, and the other is that it forwards a copy of the user-submitted URL’s to Google’s datacenter. So that, Google can increase its collection of unique URL’s in its database apart from those crawled by GoogleBot or those already exists in its database. By this, Google will get to know more about the current hot topic being circulated over the web by analyzing the total number of times the URL’s of similar topic being shortened, and it will also provide Google the basic idea of which is the hot topic users are looking for, recently. This will help Google in a smaller way to perform changes or updates to its Search Algorithm or provide more importance to these topics or categories or platforms in its future search results (SERPs). Thus it helps Google to enhance its search activities and its business, and for the user their purpose is fulfilled. This one small and simple tool which does it all for Google. Has anyone run into the problem where enough short URLs have been created using Google’s URL Shortener but only 9 pages (15 URLs each page) are displayed? Has anyone found a solution besides moving to another short URL service? Analytics portion of URL shortener is really awesome, it would be great if Google also launches an official Chrome extension for it. You should make it easier for users to learn how to safely learn the long path and get the analytics for any given shortened url. Just insert “info/” before the path component. For example, for the example you gave above, the link http://goo.gl/info/V7lg will display the updated history. This is great news! I know I am going to use it. Thanks Matt. If I didn’t check your blog I wouldn’t have known about it. I love how you took URL shorteners and made them better. Including the QR codes is brilliant! How long do these goo.gl shortened URLs last for?? Wait a minute, this does a 301 redirect? I like the shortener, but why would we want a 301? That is so cool, the QR code is everywhere now and you even see them on online blogs. I think the analytics portion of URL shortener is really awesome. You need the 301 redirect from when you convert your existing URL to the shorter version or you will lose all the strength from the page you are shortening! I have a question on the CTR of these URLs. I have seen that google is keeping every information of CTR on this shortened url. So, my question is: as google values the CTR of a link at SERP, will google also value the shortened urls CTR in the same way? I think if it was limited to certain users, (Google +), this could limit spam, and gain more usage and by limiting its usage, custom urls would be more meaningful. The short URLs are great. I do wish there was a better way to traverse my long list of short URLs in my account. I have something like 16 pages of URLs. If I made a backlink with goo.gl ? Is there any effect on link juice ? Will I get the same results as normal ?